Cor-Ban 35 Undyed is designed to be a long lasting, high solids, low volatiles, high penetration, water displacing, corrosion inhibiting compound for use on high profile aircraft substrates; upper edge floor beams, wheel wells, pressure deck and center wing sections. The finished coating is non-tacky with a light yellow tint. Cor-Ban 35 undyed offers the fast dry time and thin film of BMS 3-23 and the long lasting corrosion inhibition properties of BMS 3-29. 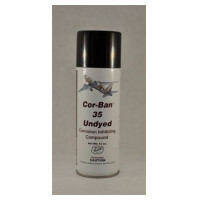 Cor-Ban 35 undyed does have a UV absorber in the product. The product can be applied by conventional airless or air-operated spray equipment. The coating should be applied at 1 - 1½ mils (25-38 microns) wet thickness. Aerosol application is available. All properties represented were achieved with a dry film thickness of 0.5 - 0.75 mils (12-19 microns). One aerosol can covers approximately 95 ft² (8.8 m² ) . Cured Cor-Ban 35 undyed can be removed with D-5615NS, D-5640NS, or mineral spirits.